This is an official statement from the Honorable Minister Louis Farrakhan, the Executive Council and the membership of the Nation of Islam and all those who struggle for the unrealized goal of freedom, justice and equality. It is with great sadness, accompanied by great joy, that we heard the news that Winnie Madikizela Mandela, the mother and the heartbeat of the revolution, had passed. The sadness that I feel and we feel is that this great woman of struggle has been called back to the only life-giver that there is, Almighty God Allah. But the joy is that the heartbeat of the revolution can never die. For the revolution cannot die until true freedom, justice and equality come to every member of the suffering Black people of South Africa and Africa, and all those who suffer injustice. When I visited South Africa on a chartered flight, when I stepped off the plane to fulfill an appointment with President Nelson Mandela, there was a man at the bottom of the stairs of the plane wrapped in chains. I looked at him and the journey continued to a beautiful five-star hotel in Johannesburg. And when we got out of our vehicles to go into the hotel that same man was there in chains. When I went up to my room I said to myself, and to others, he is telling us that South Africa is not yet free. Mother Winnie Mandela in our meeting said to me that the enemy’s promises of tens of thousands of homes and electricity were never realized. A political compromise for the sake of non-violence was made so we would gain political power, a national anthem, a flag, and a place at the United Nations. But, the yet unrealized dream of the ownership of the wealth of South Africa returning to the Blacks remains. So when I met Mother Winnie Mandela at her home and we talked, she still was the heartbeat of the revolution. And today under a new president with new vision, the compromise has ended and the struggle begins anew and again. This struggle can never end with an anthem, with the appearance of political power and lacking the substance of economic power. The heartbeat of the revolution will continue until every square inch of South Africa is liberated and once again in the hands of the Original Owners of that land. 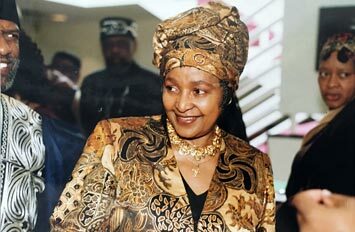 May the memory of Mother Winnie Mandela and the struggle that her husband and she waged always be remembered. So long as the struggle for power and control of the country—which has never been fully in the hands of the original people of South Africa—is unrealized, the heartbeat of Winnie Mandela will continue to send the life of liberation through it. Not only to free every corner of South Africa but all of Africa must eventually go free. And the wicked ones who have stolen the land and the wealth of Africa must eventually give it all back or it shall be taken back by God and the people who refuse to let that heartbeat of true liberation, freedom, justice and equality die. She lives and the struggle continues until total victory. As-Salaam Alaikum. Peace unto all who struggle.